So.cl is not a social network, so what is it? Facebook’s anticlimactic IPO isn’t the only the only thing that happened lately in the world of social media. Since last year, rumors swirled about a new social network in development at Microsoft’s FUSE Labs. Many wondered what a new network could bring to a social media universe already crowded with players like Facebook, Twitter, Google+, LinkedIn and even Lady Gaga’s Little Monsters. The public had a peek at the not-so-secret site last July when someone at Microsoft “accidentally” published the home page and revealed the network (then code-named Tulalip). For months, Microsoft only allowed students studying information design at the University of Washington, Syracuse University, and New York University to access what it referred to as an “experimental research project.” Now, the restrictions have finally been lifted. Microsoft quietly moved So.cl out of beta and opened it to everyone—or anyone with a Facebook or Windows Live ID. Microsoft designed So.cl for students searching for and sharing content, but it seems the company made no effort to limit access only to academia, so feel free to take it for a spin. The banner and the domain name might lead you to believe So.cl is a social network; it isn’t. So.cl is a social sharing and curation site built on top of Bing. Yes, So.cl has all the features you expect from a social network like profiles, the ability to follow other users, activity streams, private messages, and even video sharing. However, the social features are just adornments to the real focus of So.cl: search. Feed: Displays the activity stream, which can show posts from everyone or be filtered. 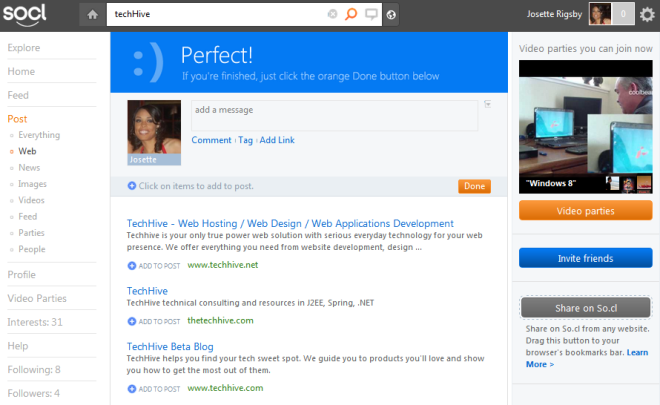 Post: Allows users to create a post or add to an existing post. Profile: Displays the user’s profile and activity. The profile page also provides an option to change site settings. Parties: Allows users to create or view a shared video. It is the posts that make So.cl unique. Users construct posts by searching for a topic and selecting the best results. The poster can add a comment and select links, images, or any other content that Bing returns in search results. Once a post is created, other users can comment, share the post, tag it with and interest, or "riff"—which allows users to comment using an image instead of words. In addition to the search-based posts, So.cl’s video parties also differentiate the site. Video parties are not video conferences in the style of Skype or Google+. Instead, video parties allow users to create compilations of YouTube videos that they can share with other users. 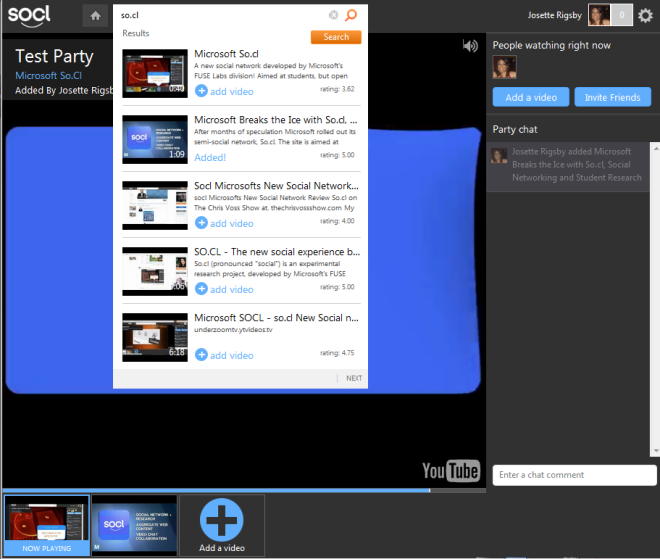 Users that watch the video party can add to the video collage or text chat with other viewers. Microsoft’s goal is for people to create high quality collections of content around a subject area, similar to how students working on a research project gather supporting material. The site’s users are not living up to the Microsoft’s visions. Currently, the site’s content is mostly a mashup of photos of attractive women and pop culture references. Viewing an interest area like "technology" returns lots of irrelevant information. The privacy controls in So.cl are also lacking. By default, everything users search for in So.cl is public. An individual post can be made private by clicking the not-so-intuitive world icon beside the search box at the top of the page. There is no way to limit the visibility of a post to a specific set of users. The only other privacy features are an option to delete search history and the ability to delete a user account completely. Overall, the site's navigation and features feel a bit cumbersome. This is surprising given the numerous examples of rich social functionality that Microsoft had to draw upon. Many links and buttons do not function as expected. The flexibility to control content visibility that users now expect from a social network does not exist, but So.cl isn’t really a social network. Bing’s new three-column design displays search results in the first column and quick facts like maps and customer reviews in the middle column. In the final column, users signed into Facebook see a list of friends that might be able to provide information related to the search. Users also have the option to ask their friends a question right from the social sidebar. Currently, Bing’s social features only work with Facebook, but Microsoft plans to add Twitter, Google+, Quora, and LinkedIn. Although the company has criticized Google, Microsoft is heading down the social search path Google paved. Before long, the division between Bing and So.cl may disappear. It seems Microsoft is gradually transitioning from social as a stand-alone capability to social as a feature that can be integrated into other services. Even if So.cl does not gain widespread adoption, it will provide Microsoft a useful source of information about search usage and how users value content.